Did you know that many poskim hold that Birchos HaTorah must be recited BEFORE Ma Tovu and Reishis Chochma? Did you know that it's preferable to say Elokai Neshama right after Asher Yatzar? 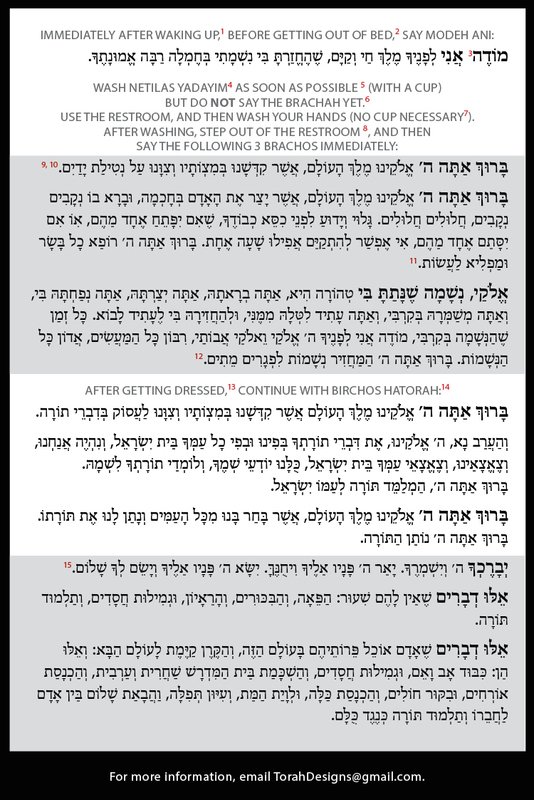 This Morning Tefillos/Brachos/Routine card is meant to assist those who wish to follow the preferred order of saying brachos, tefillos, and washing Netilas Yadayim in the morning. Although this is the recommended order, some parts of this procedure are not the strict halachah, but rather recommended. It is still possible to follow all halachos if you do your morning routine in a different order. Please consult with your own Rav for guidance in this matter.